"Never fail to listen to the advice of your friends". 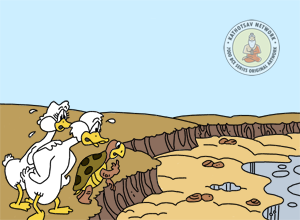 There lived a turtle called Kambugriva in a lake, who had two swans as her good friends. All three of them would meet on the banks of the lake every day, and exchanged stories, before returning at sunset. They enjoyed each other's company. One year, there was no rain and lake started to dry. The swans got worried about the declining water level of the lake, and said to the turtle, "You will not be able to survive in this lake. All the water in the lake will soon dry up". The turtle was aware of the problem, "It is indeed difficult to live here anymore. Dear friends, please look for an alternate lake which is full of water. Then, find a strong stick from somewhere." The turtle continued, "Once you find another lake, you can carry me to the lake with a stick. 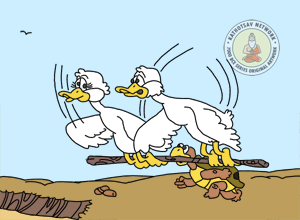 I can hold the stick tightly with my mouth, while both of you can hold the stick at either ends and fly". As planned, the swans flew to distant places and after some time found a lake which had plenty of water in it. They returned to carry the turtle. They prepared to hold the stick from both the ends, and suggested the turtle, "Dear friend, everything seems fine. But make sure to keep your mouth tightly shut all the time. You must not speak, or you will fall off." Finally, they started flying. After some time, they had flown some distance when the turtle saw a town below. The people of the town were staring at the sight of two swans carrying a turtle in the sky. "Look at that! 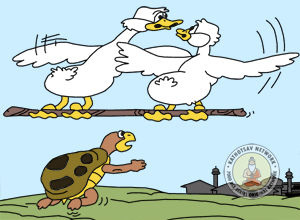 This is a rare sight that two birds are carrying a turtle with the help of a stick", they shouted in admiration. On hearing all the commotion, the turtle opened her mouth, "What is all the commotion about? ", she asked. Needless to say, she went down the moment she opened her mouth, and the swans could do nothing to stop her from falling down to the earth. As she fell down, the people of the town captured her to make a feast out of her. Never fail to listen to the advice of your friends.